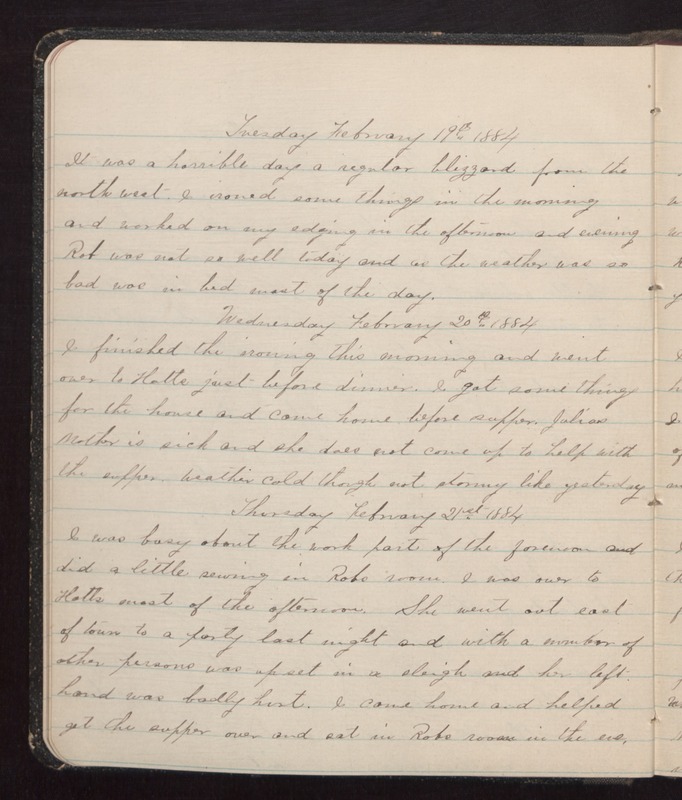 Tuesday February 19th 1884 It was a horrible day a regular blizzard from the north west. I ironed some things in the morning and worked on my edging in the afternoon and evening Rob was not so well today and as the weather was so bad was in bed most of the day. Wednesday February 20th 1884 I finished the ironing this morning and went over to Hatts just before dinner. I got some things for the house and came home before supper. Julias Mother is sick and she does not come up to help with the supper. Weather cold though not stormy like yesterday. Thursday February 21st 1884 I was busy about the work most of the forenoon and did a little sewing in Robs room. I was over to Hatts most of the afternoon. She went out east of town to a party last night and with a number of other persons was upset in a sleigh and her left hand was badly hurt. I came home and helped get the supper over and sat in Robs room in the eve.